Partnering to offer preventive healthcare and experiential learning through service. It is a free clinic that offers the following services. 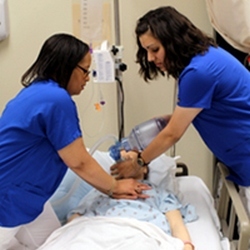 Care is provided by registered nurses who are students in Allen College's nurse practitioner program (supervised by a certified nurse practitioner instructor) as part of their clinical and service learning requirement. The clinic is located at the Salvation Army on the corner of Logan Ave. and Hwy 63. Persons should enter the 207 Logan Ave entrance (by the chapel) and signs will direct you downstairs. No, but appointments are encouraged if you have special needs such as specific immunizations or need an interpreter. All services provided at the clinic are free including medications, vaccines and lab tests. Since the clinic is staffed by students, the times vary depending on student schedules. You can call the Salvation Army at (319) 235-9358 for information on clinic times or view the calendar - Spring 2019.